A friend asked me to build him a GPS logger that he could take up a few remote mountains in Kyrgyzstan. Previously he had used a Garmin which logged longitude and latitude, but not height. Height is important if you like climbing mountains. Here is a log of the build, with successes and failures. One thing thats lacking in the picture is the battery regulator, its the same size as the main micro controller and fits right on the back. 1) is the GPS, its about the same size as a 2 pound coin and twice as thick. 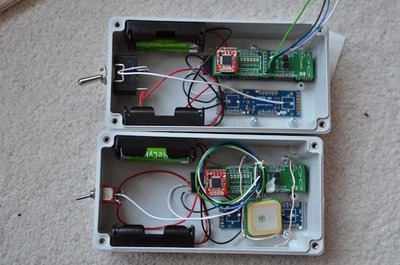 2) is the micrsd card datalogger. Its everso slightly longer than a microsd card and about half as wide again. It can take 16 gig cards, but I’ve got two gigs in there currently. 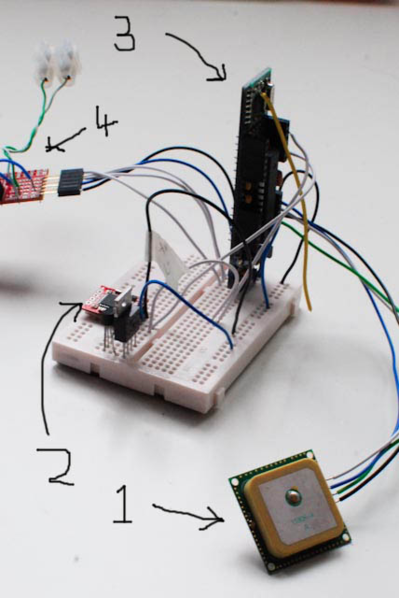 3) is the main microcontroller (http://jeelabs.com/products/jeenode) has the same internals as the datalogger, just a different form factor. 4) is the usb-serial converter. This is used to programme and debug the badboy. So I have been gradually working out the kinks and I’ve created a working prototype that fits into a box. This will allow me to gather some real data and tune the performance. Its made out of veroboard, so its rather large. 1) put the processor (and switch off the GPS and datalogger) into the lowest power state for as long as possible. 2) use a low voltage, high efficiency step-up voltage converter. I now need to shrink the whole thing into two boards so that the whole thing excluding batteries and antenna is about the same size as a pack of gum. Time to make my own PCB, something I haven’t done since high school. I’ve had a solid weekend of tinkering time. I’ve done lots of boring thing like adding timeouts so that if the GPS fails to get a fix(like when your in a cave) it doesn’t run the battery down trying to get a position. I’ve also made use of the radio that comes with the micro controller. So when I’ve been out and about, or I need to put the GPS in the freezer, I can see how well its doing in real time. No messing about, just switch on the display, and I can tell how long the its been logging for, what time the last fix was, and where it thinks it is on earth. This is important because normally you’d have to switch the whole thing off, remove it from its case, and read the memory card. However this destroys the current state of the jeenode. Because the whole thing is designed to stay switched on for a couple of days, and I have a limited amount of time, being able to debug in real time is important. 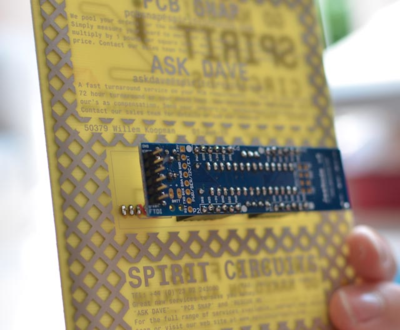 The PCB has been designed to piggy back on the Jeenode. I’ve also added an expansion slot, which allows Jeelab’s expansion PCBs to plug directly in without modification. There is a switch attached to the interrupt pin, this allows me to trigger a wake up from the deepest power saving state. 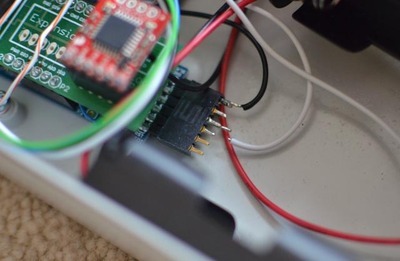 There is also an option to add a 1-wire temperature sensor. Good news everyone. 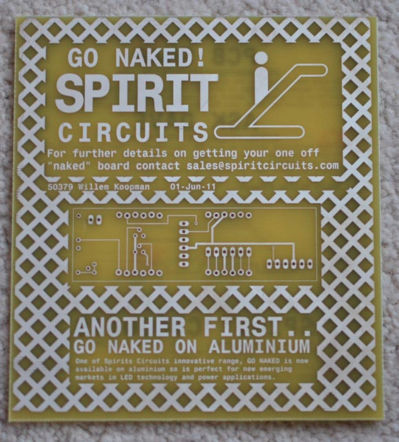 I’ve got the PCB prototype back from the printers, and baring 1 minor mistake every works as intended. I’m either a genius or lucky. As its a prototype the company have put loads of advertising all over it. However as its a fast free service, and really high quality, I’m not complaining. 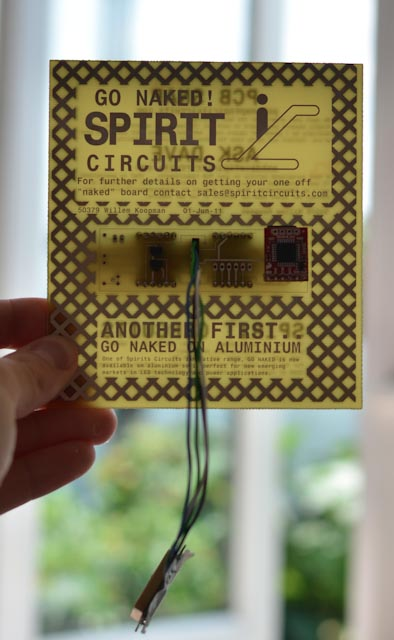 All hail Spirit Circuits. Anyway see attached pictures of PCB in its naked form, and populated with GPS goodness. Now its time to fix mistakes, resend to the printers and then put in a case and I’m finished….. There is space for 4 AA batteries. 2 of which are optional. With a full battery load we should be able to last about 12 days continuous logging. They are encased in an IP65 waterproof/dustproof case. To keep the parts from wobbling about, they are held in by wire. Not the most idea of materials, but time was tight and it was the only thing I had to hand. well, the trip was mostly successful, see http://www.thebmc.co.uk/News.aspx?id=4423 for the full official report. The hardware however had mixed results. Sadly, the battery holders are about a millimetre to high, which stops the lids from closing properly. If you over tighten them then the holders become loose and does the following: So no reading from the base station 🙁 it appears that being in the back of a Russian truck on bumpy roads isn’t ideal for hardware. Needs more super glue. Another worrying problem was that despite quadrupling the battery capacity it still only managed to last three days. Something that back in London at least was done with just a single AA. It could be due to temperature, or something else. I’ll do some runs in the freezer to see what happens. 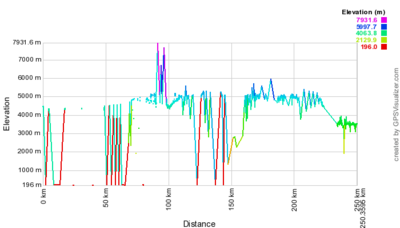 As you can see there is some need for some filtering to remove some of the more “interesting” data. London is not a good testbed for mountain hardware. Using solid core bell wire is perhaps not the wisest choice. Picking up the finished article and shaking it until you see stars is not a close approximation of a land rover over rough terrain. However Now that I’ve ironed out most of the bugs, I’m pretty sure the loggers will work much better next time. Well to Gareth, Martin, Charlie & Hannes who conquered massive mountains for Queen and country (Kung och land for Hannes) , and for lugging my untested hardware to the edge of civilization. Ryan[hackaday]: Lithium AA cells would fair much better in the cold vs Alkaline, not to mention longer lifespan. Dr Gareth: [Lithium] batteries are pretty near cripplingly expensive in Kyrgyzstan, so we had to have something that could be used with any kind of easily availably battery. We probably could have got some in London but we were on a pretty aggressive budget so trimmed everywhere. The Duracel NiMiH cells lasted plenty long enough, though the 20hr snow storm finished off the mobile unit. 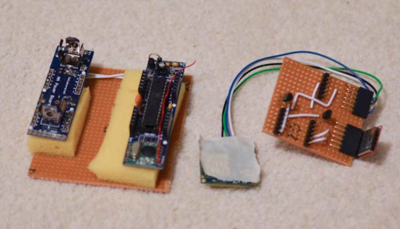 Phil[Hackaday]:Harsh weather of London? In comparison with a snow covered mountain top? Surely you jest. Willem: yes, full jest. You should have temperature tested it by tossing it in an industrial freezer and see how well the electronics and battery performed over time. 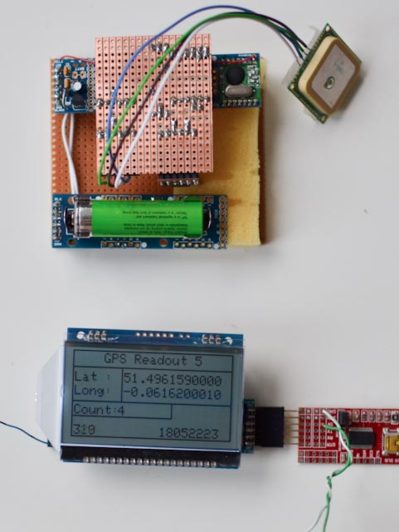 (Granted you wouldn’t get any GPS signal inside a freezer, but the purpose is to test the electronics and power source). Willem: Good points, I realise now looking at the article that I didn’t explain that I did indeed freeze the whole system, it was infact part of the motivation to use the radios. Consumer freezer are actually ideal as they are made out of plastic, which is permeable to GPS, just about. I realize you were on a restricted budget and time schedule, but that’s hardly a justification for doing things half way – you might as well have just took along a commercial GPS instead, and may have gotten better results. Willem: There is some truth to that, however there are no cheap solutions that did what we were attempting to do. The last expedition used some Garmins, but they were designed for marine navigation and didn’t record height. Also there really aren’t that many IP65 rated loggers, let alone any with massive battery capacity. (or ones we can even afford) We’d also have to buy two, one for the base station, to record the offset, and another to actually go up the mountain. Look into how spacecraft are tested – vibration testing and thermal testing (a/k/a shake and bake) in order to ensure that they’ll survive. Granted you aren’t going into outer space but the principles are the same.Willem: If you read towards the end I did go over my testing regiment briefly. As an ex-QA engineer I’m painfully aware of testing. As I said shaking the unit until I see stars is not an analogue for Russian trucks. 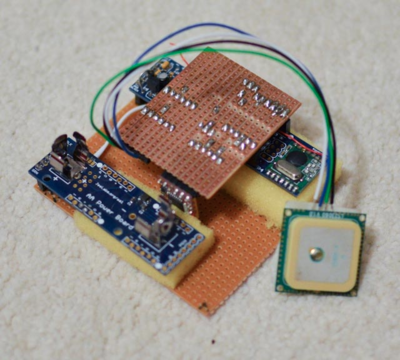 Victor[Hackaday]:Lithium cells are also required by the SPOT satellite tracker. Advantages: runs well in low temperatures and much lighter than alkaline / NiMH (every gram counts on an expedition).Check http://data.energizer.com/PDFs/l91.pdf Do however take care that their initial voltage is 1.6V, with two in series that might damage electronics that is built for rechargeables. Willem: Thanks Victor, I’ll look into those for future projects. glad to see your hacks! congratulations. please email back, need to ask some ideas about GPS logging. cheers!